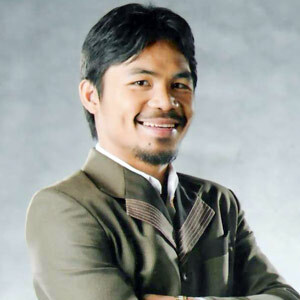 LOS ANGELES – Manny Pacquiao never takes his fights personally. The pound-for-pound king's opponents are usually quite respectful of his throne, and the easygoing Pacquiao shrugs off any stray insults with a smile. Not this time. Not in his third fight with Juan Manuel Marquez, the closest thing to an archrival for this unrivaled eight-division champion. Pacquiao's trainers are sensing an unsettling edge in the Filipino congressman, who started an all-out training regimen with pre-dawn runs and lengthy gym workouts before the fight was even announced. The steady stream of bloody, beaten sparring partners leaving the Wild Card Gym testifies to a focus that nobody in Pacquiao's camp has ever seen. "I'm not upset, but I get excited because he's claiming that he won the fights," Pacquiao said while wrapping his hands in the broom closet that serves as his dressing room at trainer Freddie Roach's gym in Hollywood. "That's why I train hard, because I want to end this, all the doubts. This is our last fight." Pacquiao admits he's insulted by Marquez's boastful insistence that he won their first two fights, which ended in a draw in 2004 and a split decision for Pacquiao in 2008. Marquez even traveled to the Philippines to plead his case to the public, wearing a T-shirt emblazoned with: "We Were Robbed." In truth, both bouts were dazzling displays of style and heart, with Pacquiao's aggression and toughness matching Marquez's counterpunching and combinations for 24 fascinating rounds. Pacquiao knocked down Marquez three times in the first round of the first fight, and he floored Marquez once in the rematch, but Marquez rallied both times to even the bouts, doing more damage to Pacquiao than any opponent in the past decade. "It seems personal to him because he talks too much, and he needs to prove it," said Pacquiao, who will meet Marquez at the MGM Grand Garden in Las Vegas on Nov. 12. "He talks a lot, and it's not good for a fighter to talk a lot without action. Me, I don't talk a lot. I just do some action." Pacquiao is sparring more aggressively and running more miles than he usually does at this point in his preparation for a fight, Roach said. He's also training smarter, with strength trainer Alex Ariza finally selling him on the benefits of an occasional day off to rejuvenate the calf muscles that cramped against Marquez. "I don't think I've seen him more focused, and I think it's because it's personal, for sure," Ariza said shortly before Pacquiao knocked another palooka through the Wild Card ropes twice in the same sparring round. "When something is personal, it's a lot different. He knows that he has to make a statement in this one. With everyone having questions about the first two, he has to make sure in this one that there's no doubt. … We're going through sparring partners like you change underwear. I'm surprised that these guys are still coming back." Even with his stellar career in full bloom over the past two years, Pacquiao has been generous to a fault with his recent opponents. He noticeably let up on Joshua Clottey and Antonio Margarito when they couldn't match him last year, and he irked many fans by constantly touching gloves with over-the-hill Sugar Shane Mosley last May, even hugging Mosley before the 12th round. "I don't see Manny even touching gloves (with Marquez)," Ariza said. "He has a disdain for the guy, and I've never known him to dislike anyone. … Manny is still a nice guy and everything, but there's something very Third World about him when he wants to be. He can be merciless. I've seen it, and it's been a long time since I've seen that. Usually he lets guys off the hook. He isn't letting anybody off the hook." It's unlikely Pacquiao would get a hug back from Marquez, a relentless competitor from the old-school Mexican tradition of brawlers. Marquez and his trainer, Nacho Beristain, are still sore losers about the second fight, with Beristain improbably alleging corruption in the judging when Pacquiao won by one round on one judge's scorecard. Pacquiao insists he won't be disappointed if he doesn't knock out Marquez, but his trainers will be surprised. The WBO welterweight title bout will be fought at a 144-pound catch weight, and Pacquiao fights comfortably at a weight Marquez has only tried once before — in a one-sided loss to Floyd Mayweather Jr.
"I don't think this fight is going to go six rounds," Roach said. "With Manny's footwork, he's just a completely different animal to the guy that fought Marquez the first time. (Marquez) has gotten up against Manny before, but I don't think he's going to be able to get up from the power Manny has now. He's a much stronger guy than he was at those smaller weight classes. He's just a completely different animal. We can put it to bed, finally shut them up, and be happy."